The area is packed with history and witnessed a drama of the twelve bloody Battles of the Isonzo (Soška fronta) in World War I. 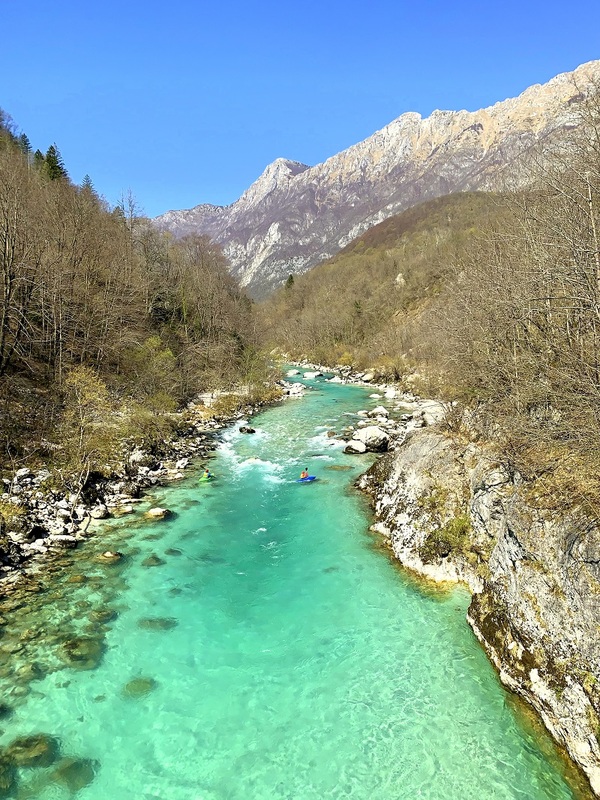 So bloody, in fact, that the otherwise emerald-green Soča River turned completely red, which even famous writers like Hemingway wrote about. 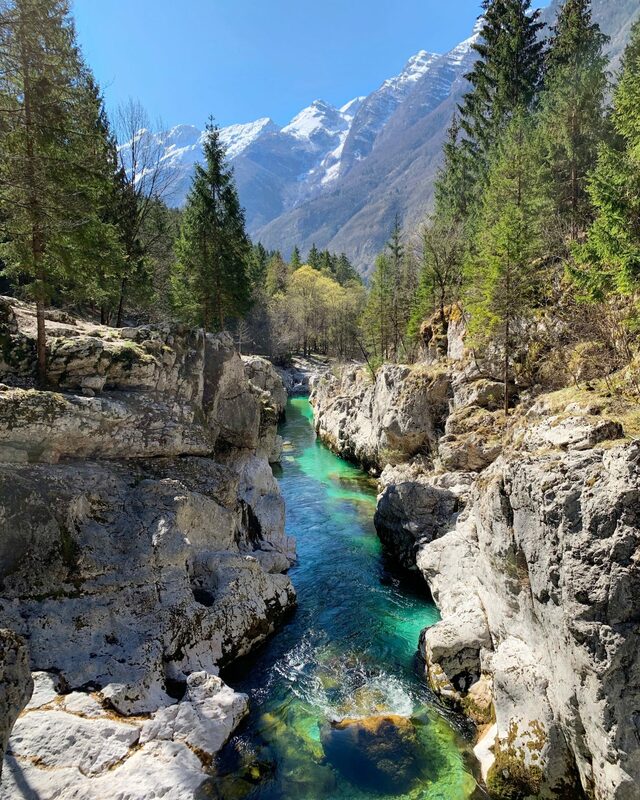 Nowadays, in contrast to its turbulent history, the Upper Soča Valley boasts magnificent hiking trails, the crystal-clear Soča River, countless other streams and waterfalls, and serene Alpine forests. 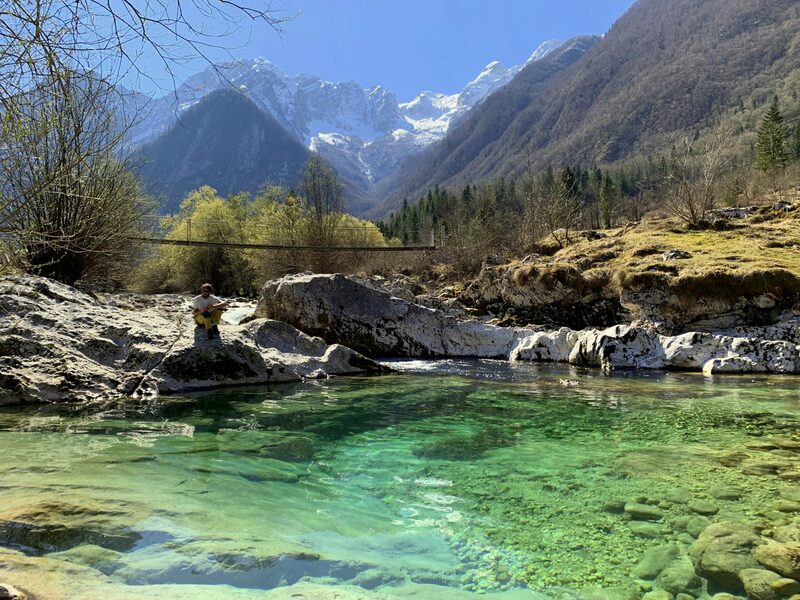 As it happens, I had been planning on returning there after my fly-fishing adventure in the Soča River with Go Fly Fishing Slovenia last summer (now I’m proud to say I caught a big trout! 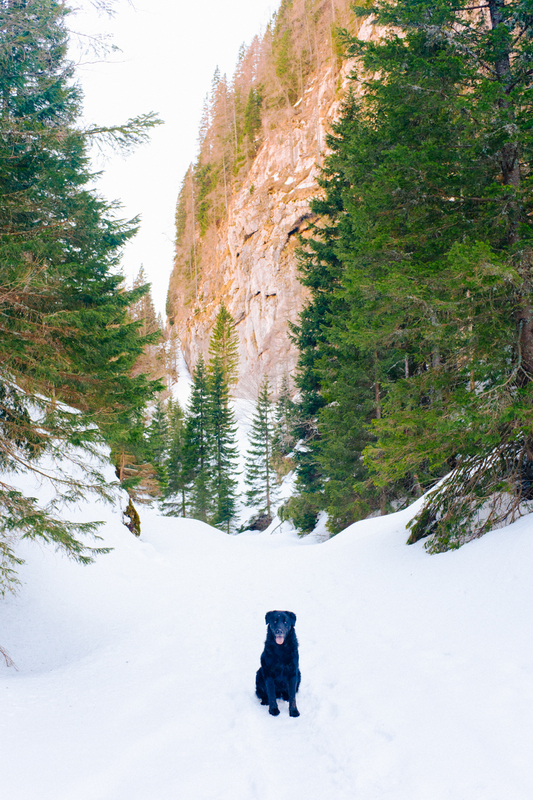 ), yet this time not to fish but rather hike up the Lepena Valley and see Krn Lake all frozen. 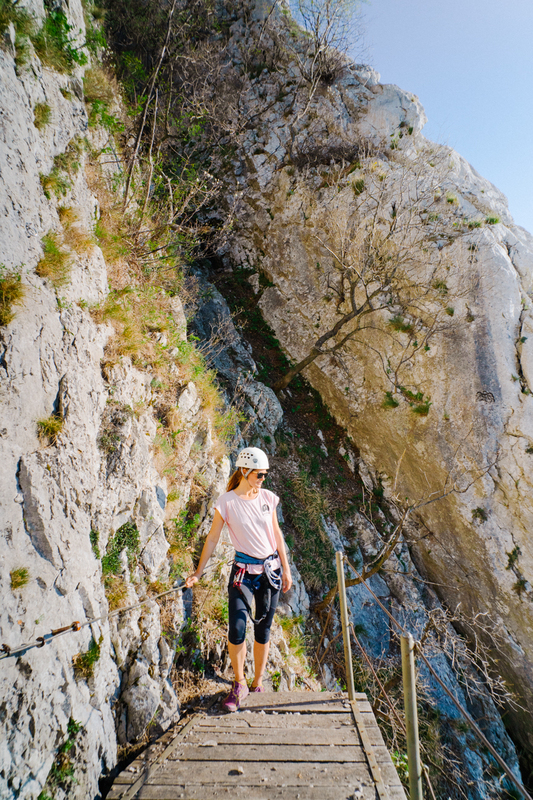 While seeing white Krn Lake had been my wish for years and as such my top priority for the weekend trip, I made extra plans to visit the Great Soča Gorge, the Boka and Kozjak Waterfalls, and finally climb a short but sweet via ferrata called Gradiška Tura on the way back home. 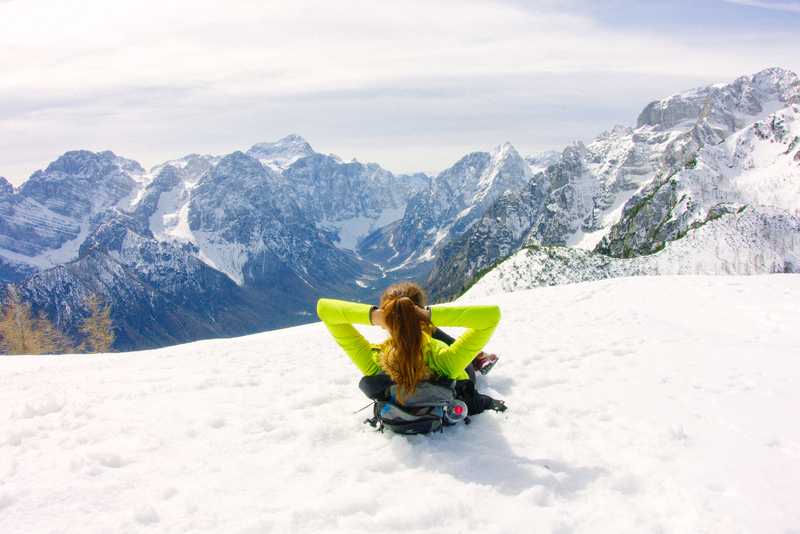 Tucked away in the beautiful western Slovenia on the other side of the Julian Alps, the pristine and beautiful Upper Soča Valley is unfortunately a very long distance from Ljubljana. 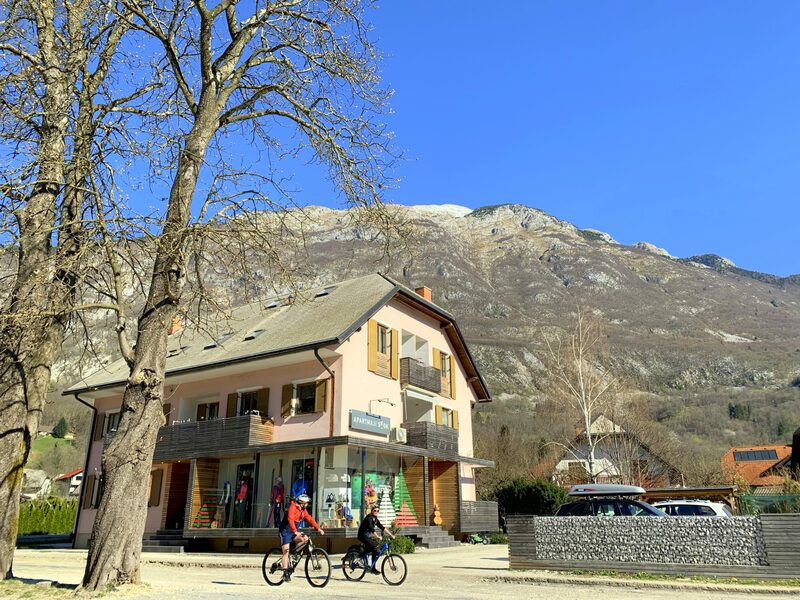 As it over a 2-hour drive from our capital, I rather opted for a weekend trip with a night spent in Skok Apartmaji, a small and friendly house with several apartments in Bovec. Perched between the mountains and just a stone’s throw away from the white waters of the emerald-green Soča River, the Skok Apartments are a haven for active outdoor-oriented people. They are also pets-friendly, so Hari could come too! 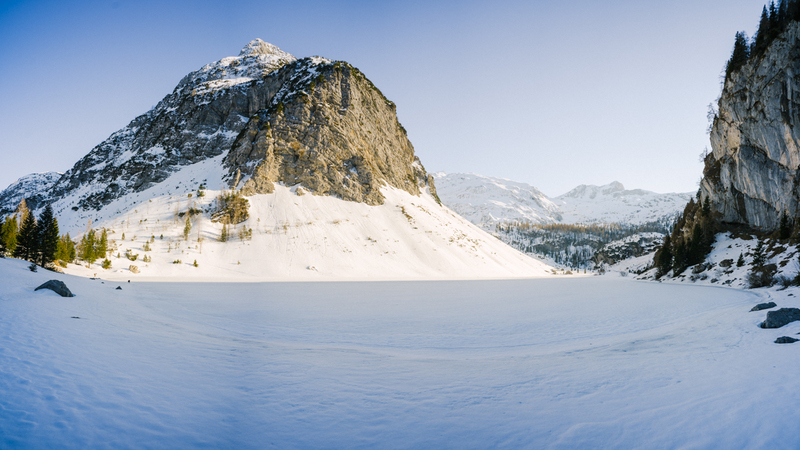 Nestled among towering mountains, the lonely Lake Krn is a picture-perfect 300-m-long and 150-m-wide lake overlooking Mt. Krn, the highest mountain of the Krn Mountains in the southwestern Julian Alps. 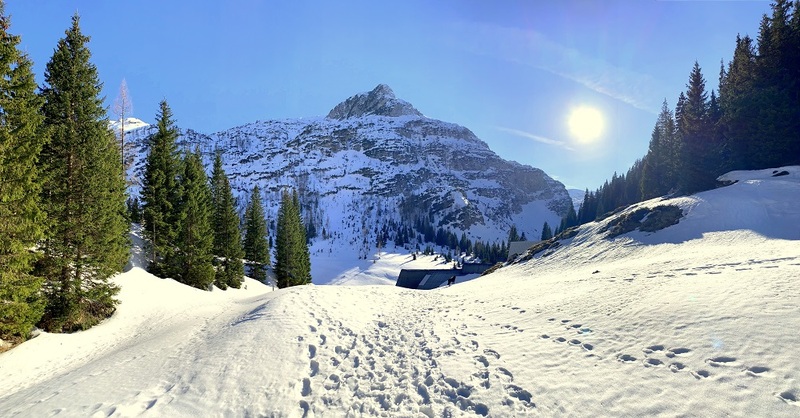 There are basically two trails to Lake Krn; a 2.2-hour trail marked from the Lepena Valley and a 5.5-hour trail from the Savica Waterfall across the Bogatin Pass, which was built by Russian prisoners during WWI. We took the shorter trail as the other one, coming from Lake Bohinj, would’ve been very hard if not impossible to hike since the still thick snow cover was all softened by the sun. The first and more relaxed day was followed by a day packed with activities. 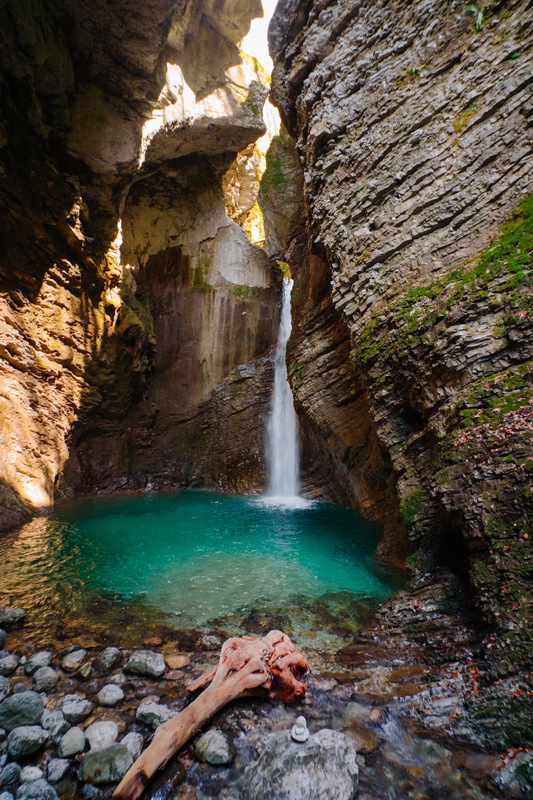 It started at 9 a.m., when we first visited the beautiful 750-m long Great Soča Gorge, then the powerful 106-m tall Boka Waterfall, followed by the mysterious Kozjak Waterfall hidden in a stunning rocky amphitheater. After an excellent lunch in Kobarid, we slowly headed back towards Ljubljana with a long stop in the steep mountains near the town of Vipava. 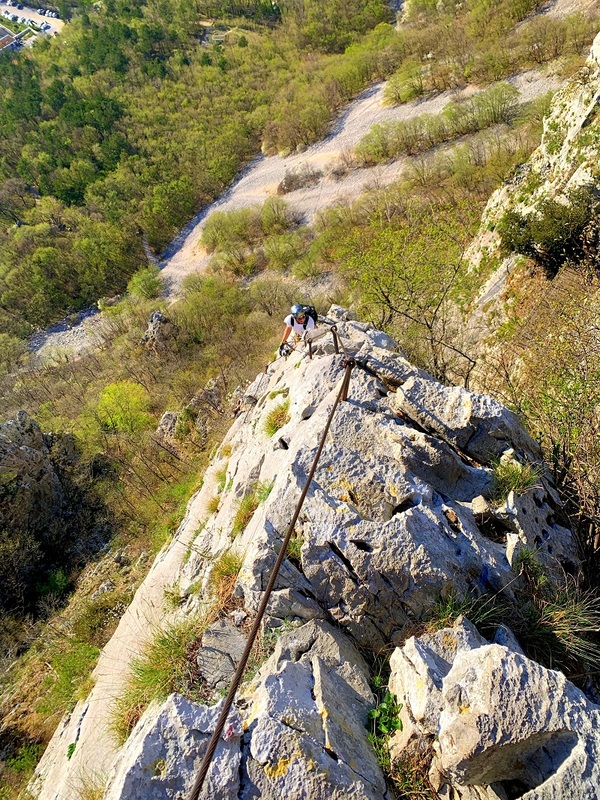 Gradiška Tura, a via ferrata climb up the near-vertical walls above the small town, had been calling me for quite some time, and the warm early April temperatures were just perfect to tackle it. Until next time, y’all, and stay tuned for more outdoor adventures! Follow me on Facebook, Twitter, and Instagram, and subscribe to the newsletter. 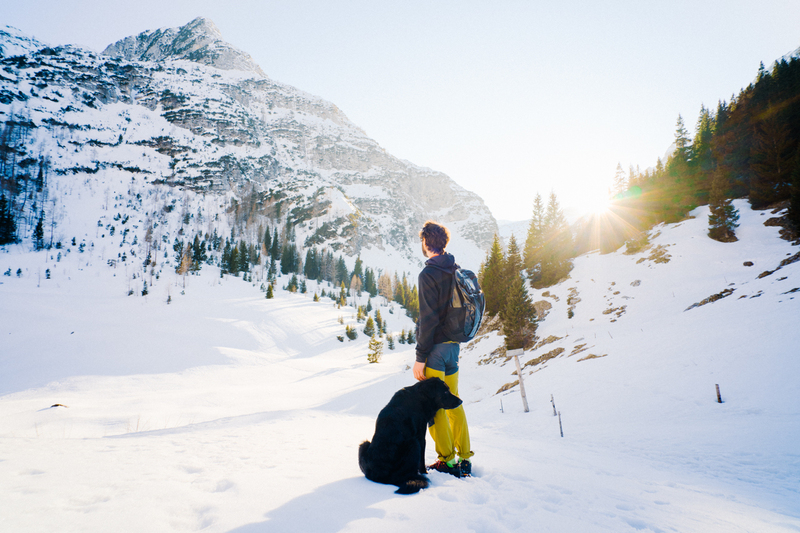 Looking forward to a tour in the mountains? 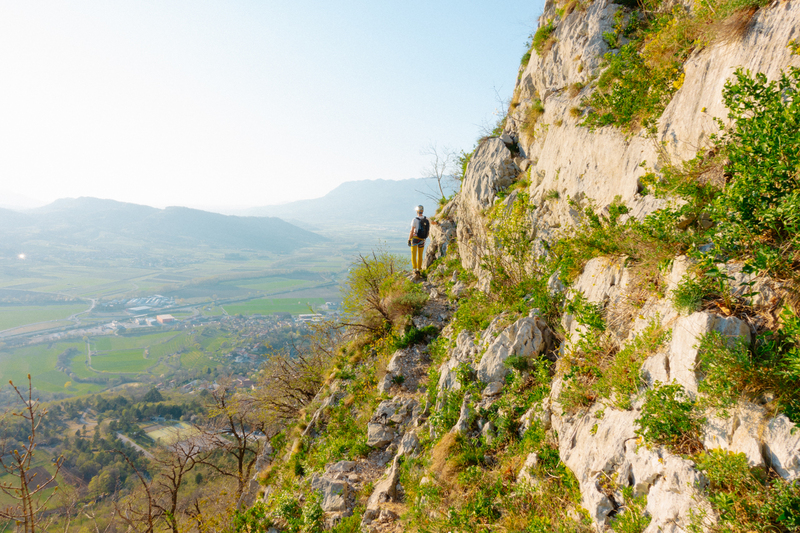 Exploring Slovenia now offers hiking and climbing tours!